Despite its Chicago landmark status, the old Viceroy Hotel on the city’s Near West Side hadn’t had much to cheer about in recent years, much like the people who used to live there. It was down and out and so were the guests. But a new day’s dawning for the handsome art deco structure at 1519 W. Warren Blvd., thanks to a $20 million plus transformation of the space into Harvest Commons – 89 affordable studio apartments for people who are at risk of becoming homeless or were incarcerated and are trying to get back on their feet. Mayor Rahm Emanuel, and the cast of hundreds typically required to finance affordable housing deals, cut the proverbial ribbon on the rehabbed building Friday morning, ushering in a new era for the Viceroy on the southern edge of Union Park. Heartland Housing, Inc., the development arm of the Heartland Alliance, is the developer (along with First Baptist Congregational Church) and did most of the heavy lifting. 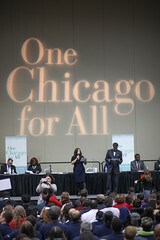 But a host of other organizations, including LISC Chicago, had a hand in making it happen. The affordable apartments at Harvest Commons will provide housing to people of modest means. LISC’s financial contribution was more than $432,000 in predevelopment loans and bridge financing that allowed Heartland to cover architectural fees, market studies, title searches and other such essentials necessary for any real estate project. LISC also provided a $25,000 “project initiation loan” to St. Leonard’s Ministries for predevelopment expenses related to Gracie’s Coffee Shop, a 2,000-square-foot commercial space on the ground floor that will employ the formerly incarcerated women who are expected to be among Harvest Commons’ tenants. St. Leonard’s, just a few blocks west on Warren, will also supply supportive services for residents. Additional partners include U.S. Bank, Enterprise, the Illinois Housing Development Authority, the City of Chicago, the Illinois Department of Commerce and Economic Opportunity, among others. But LISC Chicago also played a key role through its support of the Near West Side Community Development Corporation, the New Communities Program’s lead agency in the neighborhood. In the quality-of-life plan it developed through NCP, Near West placed a significant emphasis on maintaining, and developing, affordable housing. The rehabbed Viceroy fits the bill perfectly. She noted that the “working poor” who likely will be prime tenant candidates, don’t have many comparable housing choices in the neighborhood, which is convenient to downtown service jobs, public transit, health care services, educational institutions and recreational facilities. See more coverage at DNAinfo.com.